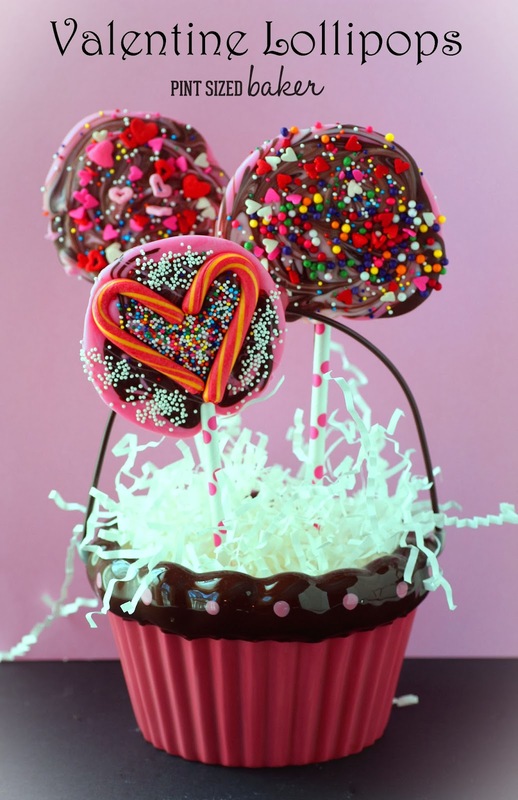 I think that these Kid’s Valentine’s Lollipops look so cute when they’re set up in a cute goody bag or gift bag! They’re fun for everyone to make! Looking for an easy Valentine treat to make with your kids? 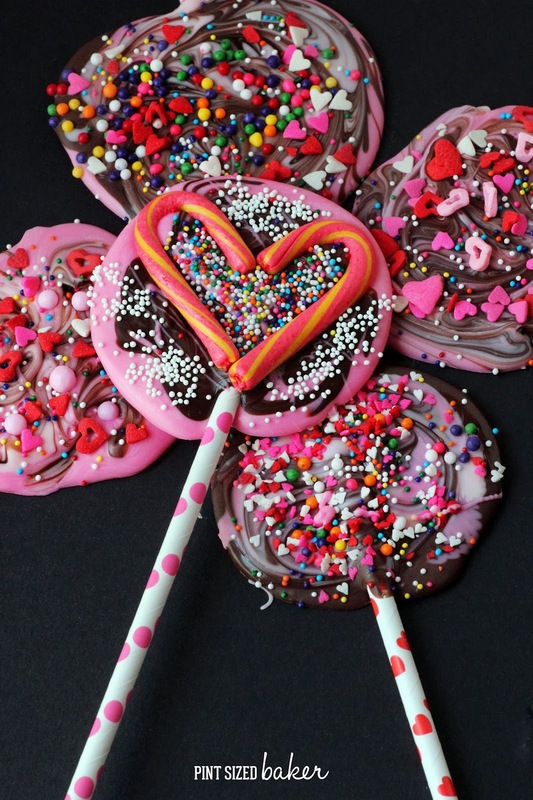 I’ve made fun Lollipops for the past two years, so why should this year be any different? I love making them with my daughter. She get’s such a kick out of DUMPING all the sprinkles on the candy. 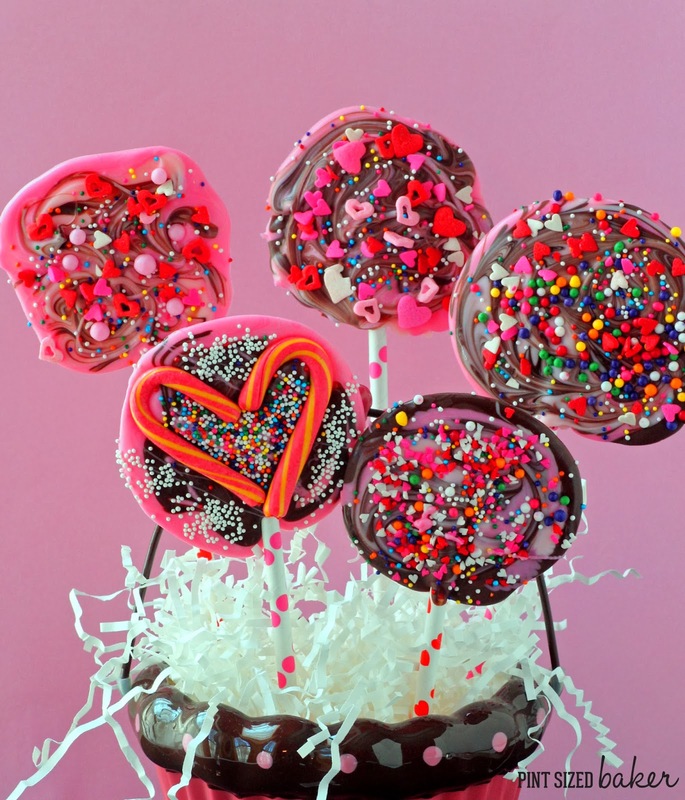 I’ve generally have left over chocolate after making cake pops and goodies so, it was no big deal to make these fun lollipops. Just get your favorite sprinkles and candy. I mixed some dark chocolate, light pink and the new Wilton’s Hot Pink candy melts. I loved the swirls and the colors. And since candy canes make such perfect hearts, we added a mini one to make it just that much more special for Valentine’s Day. Line a cookie sheet with wax paper and lay out the lollipop sticks. You should get about 6 lollipops on a standard size cookie sheet. Melt the candy melts according the directions on the bag. I pour mine into a ceramic mug and microwave for 1 minute then stir. Put them back into the microwave for 40 seconds at 70% power and stir until it’s all melted and smooth. Pour out some of each color in a round shape and drag a toothpick to swirl the colors a bit. Roll the lollipop stick or paper straw flat in to the chocolate and then lay flat on the cookie sheet. Decorate with sprinkles and set them aside to dry.